FILE - An employee counts Russian rouble banknotes at a shop in Krasnoyarsk, Dec. 26, 2014. "An increase in the speed of operations is an advantage in such an operation," the company said in an emailed statement. 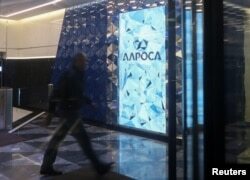 "We carried out the transaction itself in one day, in several hours," Alrosa said, adding that on this occasion the currency move was in the client's favor.